In the last decades of the nineteenth century, concern was growing in the Australian colonies about the level of ‘coloured’ immigration to Australia, particularly from China, and many colonies passed restrictive immigration legislation. Following Federation in 1901, one of the first pieces of Commonwealth legislation passed was the Immigration Restriction Act 1901, based on the earlier colonial legislation. The overall aim of this and other related legislation was to limit non-white immigration to Australia, particularly Asian immigration, and thereby preserve the predominance of the British within Australia. A new feature of the Act was the Dictation Test. The Dictation Test applied to all non-European people entering Australia between 1901 and 1958. The applicant was required to write out 50 words in any European language (after 1905, any prescribed language) dictated by an immigration officer. As the language used was at the discretion of the officer, it was easy to ensure failure if an applicant was thought to be ‘undesirable’, either because of their country of origin, criminal record, medical history or if they were considered morally unfit. A person who failed the test was deemed a prohibited immigrant and deported. 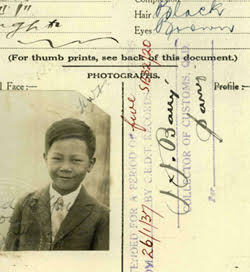 Certificates of Exemption from the Dictation Test were available to non-European Australian residents wishing to travel overseas temporarily, and to non-European visitors entering Australia temporarily for work, education or to visit family. The Dictation Test was abolished in 1958, signalling the end of the White Australia Policy. It was not until many years later that the Racial Discrimination Act 1975 was passed. Despite the restrictive legislation, many non-European immigrants, including people from Asia, did enter or continue to reside in Australia during the period of the White Australia Policy. Records in the Archives’ collection show how these people negotiated the restrictions imposed by the Act, the impact it had on their lives, changing community attitudes to the Act, and the negative impact this legislation had on Australia’s relations with Asian neighbours. These records are useful for both understanding the Act and its impact on Australian social and political history, as well as for researching family history.